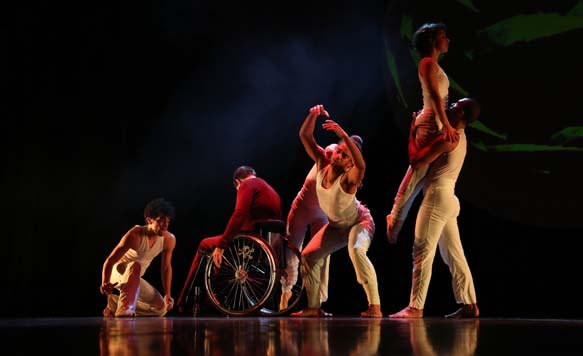 Five members of the TANZMOTO DANCE COMPANY dance together with 40 amateur dancers in the age of 9 to 70 - 34 are pedestrians and 6 dance in a wheelchair. "On a roll" is a winning streak, a run, a continuity: spinning wheels, smooth movements, a group in flow, in a limbo between walking, driving, tumbling. However, individuals, who could not be more different, stand out of that group: young and old people, amateur and professional dancers, pedestrians and wheelchair users. They show their own characteristics and switch the roles. In the pictorial choreographies all the different dimensions of movements appear. Emotions of limitations and pain alternate with curiosity and joy. The fear of the taboo develops into an exploration of it; the prejudice becomes open-mindedness and interest. The wheelchair becomes an instrument, the special physicality for an individual expression. In a dialogue with each other a new language arises, a poetry, a new type of dance. Additional shows: 9th May, 7 pm; 18th +19th May, 7.30 pm, Sommerblut Festival 2013 in Cologne.